Some of you may be fairly new to this site and, if so, then welcome! A company that I recently discovered which seems to help in this department is eeBoo. Some of you may have heard of them before and others not. 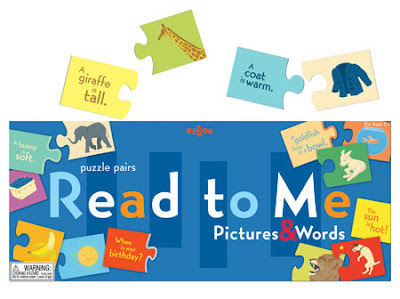 They have produced a puzzle pairs "game" (it's a game to us) called Read to Me. In this box you'll find 36 puzzle pairs. One half of the puzzle is a phrase and the other half is a picture that has to do with that phrase. The children then connect the dots and put the matching pairs together. What we do, since my son is two, is separate the cards and I hand him four pictures at a time. Then I read off the matching half of those four cards, and he puts the puzzles together. Not only is he learning to listen to a story but apply the correct image to it. He is also learning how to put puzzles together. At the same time he is playing a game and learning how to wait his turn and also follow directions. For example: I'll give him the picture halves of a bee, a lion, a penguin and the goldfish in the bowl. One at a time I'll read the cards off. It's an awesome game and VERY well made. A lot of puzzle cards I've seen (and I've seen a lot as my husband and I use to own and operate a school supply store!) are rather flimsily made. eeBoo has made quality puzzle cards that are thick, snap together very tight and firm and yet somehow come apart very easily. They are wonderful for little hands to work with and I know that I could leave my 2 year old alone with them and not worry about the condition in which I'd find them. I love these puzzle pairs and find that I have to keep them out of sight or else he will ask me to play them all the time. He loves them. I love them. And we hope you'll love them too. Eeboo has graciously offered to give away one Read to Me Puzzle Pair game to one of you readers. To win? Well, here's the catch. #1 - If you are a regular reader/commenter on this site (and I know who you are!) just leave a comment. That's all. #2 - If you are new to this site, I'd love for you to have a look around and get to know me and let me get to know you. So what I'd ask is that you browse around my reviews a bit, read one, and come back to this post and let me know which review you read and what you liked/didn't like about it. That's all! It's just a courtesy "get to know you" comment instead of the "enter me" comments. #3 - Browse eeBoo's site and see what they have to offer to your young readers-to-be and let me know what product you liked of theirs. They really are an awesome company and deserve a bit of recognition for their efforts in producing quality materials. The contest is open to U.S. residents only. The winner will be selected on Friday, February 27th. Thanks for stopping by and in the meantime, happy reading! This sounds like something I could TOTALLY use w/ my dd's in homeschool to boost those readership skills!!!! We'd LOVE to be entered, please! Sounds like tons of fun, Carrie--something my Ls could really have fun with (and mom, too!). Sign me up! What a neat idea! I think my almost 5 year old would enjoy trying to read as much as she could herself, and your method would be great for my two year old. Please enter me in the give-away. Looks like a neat game! Carrie! Sonds fantastic! I can see how useful and awesome a game like this is for development and something I am so glad you introduced to me -- I'm always looking for new things for little Sohpia! Sounds like a great game! Of course any game that makes reading a big part of the playing is great by us! My son is just starting to actually put puzzles together so I think he would really love this game! It looks like it would be helpful for learning colors too. Fun! That sounds like a fantastic game. I love that the pieces are sturdy enough to handle rough play. I visited the eeBoo site and I'm so impressed with the variety of products they carry. What a fabulous store. "As Lewis said, we need a little magic to break the spell of indifference towards truth in our own life. Above all - truth. That is the crux of the argument over whether or not it is good to use magic to tell stories. Is truth clear and does it win?" This sounds like just the type, and quality, of game that I would like to play with my young grandsons. Please enter my name in your contest. I'm new, but already LOVING your site. Someone (I can't remember who) referred me to this giveaway via twitter. I'll definitely be back! I appreciated your review of "Passionate Housewives". I thought you did an excellent synopsis of it. However, can I talk more about L. M. Montgomery? I noticed the button for the Lucy Maud Montgomery Reading Challenge in your sidebar before I even finished reading this post, and clicked on it right away. I love L. M. Montgomery! I was actually thinking yesterday and today about how her love of all things domestic just shines through her writing, and how enjoyable and refreshing that is. I was thinking in particular of the meal that Anne and Diana prepare for the author Mrs. Morgan, and then the one that they have to prepare on the fly when Mrs. Morgan shows up unexpectedly! Also, in the Emily books, Emily might be ambitious and desire to be a writer, but she's a darn good housekeeper, too! I always get hungry reading the writings of Lucy Maud Montgomery, and I want to go to PEI someday! I'm new, but I'm going to subscribe. I really liked your review of "Squeaky Green." I liked that you gave clear pros and cons to the book. I try to be more green and any good resources to help me do that are appreciated. I like the Little Robots Mission set. My little boy is a pre-reader and loves robots, so this would be perfect for him. Thanks for the fun giveaway! Your giveaway sounds perfect for both my 2-1/2 year old and 4 year old granddaughters. They're in pre-school, love to read and be read to. I really liked the Write Me a Story - Fairy Tale Mix Up. Educational and fun! I've been reading through your blog over the past couple of days, and (besides learning that I need to add something by L.M. Montgomery to my "to read" list) I was happy to find your recommendation for _Don't Make Me Count to Three: a Mom's Look at Heart-Oriented Discipline_. I often recognize (and quickly lose sight of) the need to address my children's heart attitudes, rather than simply controlling behavior to maintain "peace" in the short term. I appreciate that you mentioned this book is on a *short* list of parenting books you'd recommend - rather than just one more viewpoint to add to all the other good ideas out there. I think I'll add this one to my reading list too! Oh, and I do still intend to return the last parenting book you guys loaned me - sorry it's taken soooooo long!